This is a lengthy post (sorry), but please read it carefully and completely. During the summer I pushed the avery_wifi password to all iPads currently in JAMF, but I cannot force iPads to automatically connect to this wifi - this needs to be done, manually, on each iPad (instructions below). In a couple of weeks we will be turning ACS-iPad wifi OFF, so teachers need to make sure their student iPads are connected to avery_wifi. IF iPads are not connected to avery-wifi, they cannot communicate with JAMF and they will not be able to get apps pushed to them. IF they do not connect to avery_wifi BEFORE we disable ACS-iPad, those devices will not connect to our network and will need to be erased and reimaged. This is also true for any administrator or teacher iPads. On each iPad go to Settings > wifi > and select avery_wifi from the list. You will be prompted to "Trust" the certificate. Click Trust. Your iPad should now be connected to avery_wifi. The end. This allows your iPad to communicate with JAMF, again. It will get the avery_wifi password from JAMF. This may take a little while (one minute up to an hour or so) depending on how many other requests are being handled by the JAMF server. 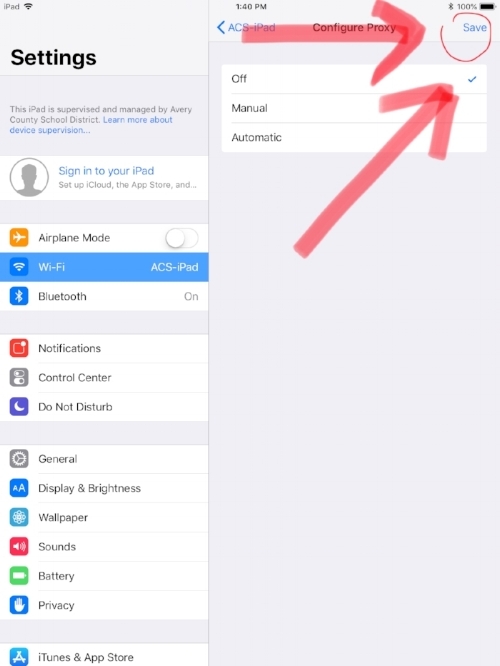 But, once your iPad receives the wifi password you should be able to complete the initial setup instructions listed under the "How to connect to avery_wifi" section of this post. Because we've had quite a few grade level changes this school year, I need to do some housekeeping in JAMF. I need to make sure I have the correct iPad inventory assigned to you. Please complete this survey IF you are not where you were last school year (classroom-wise). As always, if you have any questions or run in to any issues, please let me know!